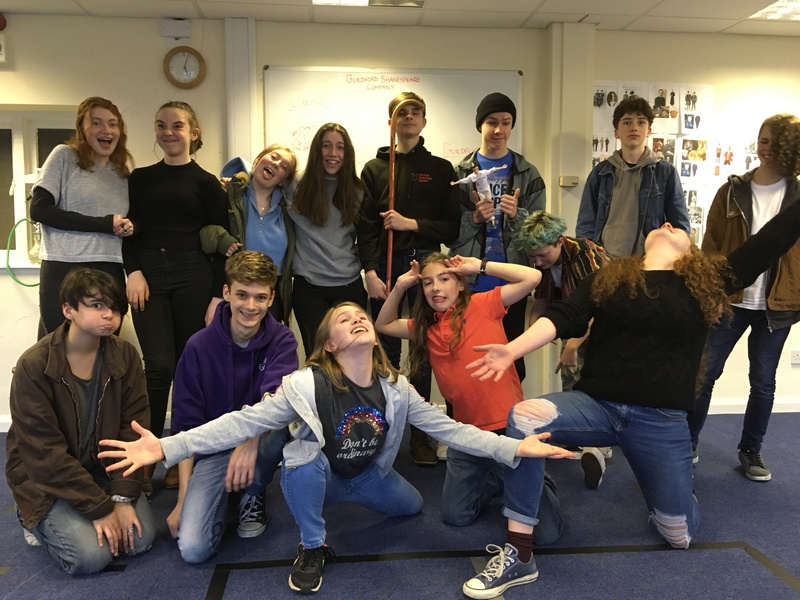 We caught up with the Young Company mid-way through their final week of rehearsals for Love and Wonder. This will be their third new play, which will debut at the Guildhall as part of Will’s Birthday Bash. You devised this play, taking three Shakespeare plays as inspiration. Can you explain the process of creating the script? Lucy: So, we started with talking about which parts we like the most from the plays and what we wanted to include in our script. Like in Alice in Wonderland, we wanted a court scene at the end. We wanted the letters from Love’s Labours Lost. Then we split up each of the plays. Dom: Someone will be given the first act of Labours, the second act of Alice and the third act of Romeo and Juliet. Another group might get the first act of Alice and so on. We put them together and come up with a small devised run-through of what that story would be like. Lucy: Then we watched them back and thought about which ideas worked well together. We got a big piece of paper and wrote down what we definitely wanted, what we kind of wanted and what didn’t really matter as much. We tried to get some sort of basic story-line to go all the way through it and then added the rest of the details to fit with all three plays. Dom: From that, Ant puts together a script. What are your favourite moments or characters that you created? Bibi. My favourite character is the princess, because she changes a lot through the play. I think it’s really interesting to see her growth. Lucy: I really like the bunnies. They’re really funny. Dom: Me, too. I thought there were quite a lot of things you can do with the fact they’re basically identical and can copy what each other’s doing. Summer: I like the duologues, when there’s two people talking. I have a great partner to do mine with and the dialogue’s funny. Alex: Me too. It’s the back and forth between Number Two and Number Three. It’s funny and stupid. Lucy: I really like the court scene and the surprise ending. I don’t think that was expected – the way that the end brings together all three different plays and has an aspect of each of them, but all in one scene. Dom: Obviously, I like Peter, because I like playing old and doddery. He doesn’t quite know what’s going on. It’s quite fun to be shocked by everything around him. Cai: We see what works and what doesn’t, by trying out different techniques and performance styles. So, changing the energy of a scene, being really unhappy at one moment, or changing your emotion completely and still making sense of it. You try what works and, if its work, it works! Logan: My favourite part was working in the Guildhall. I think that really helped us create a different vision and work out how performing in our rehearsal space would convert into the real venue. This is the third year of the company. What makes it such a special group to be a part of? Dom: The people. Everyone’s very nice and everyone’s good at what they’re doing. Willow: We have such a range of people and ages. We’re a close-knit group and the performance benefits from the close friendships. Lucy: It also feels professional. I really like the fact that we can write the play, so we can form the characters ourselves. Bibi: Devising the play and acting it means we understand the play well and the group’s really fun to work with. How will this year’s production be different to last year’s? Dom: More complicated. I guess, for the first time we’re devising from a play that isn’t Shakespearean. I think it’s added a very different kind of feel and atmosphere. It’s a lot more weird and strange. Lucy: Last year’s was a lot more serious. This one’s got more interesting characters, which were a challenge to take on. Luca: You don’t know what to expect. It’s taken the original pieces, but they’ve been stripped. We’ve put them together in such different orders and it’s all over the place. Mallie: I think the biggest change for me is the venue. For the last two years we’ve been in St Mary’s Church. This year, being in the Guildhall, it gives it such a completely different atmosphere. We’re able to utilize it in a very different way, which gives a different atmosphere to the performance.